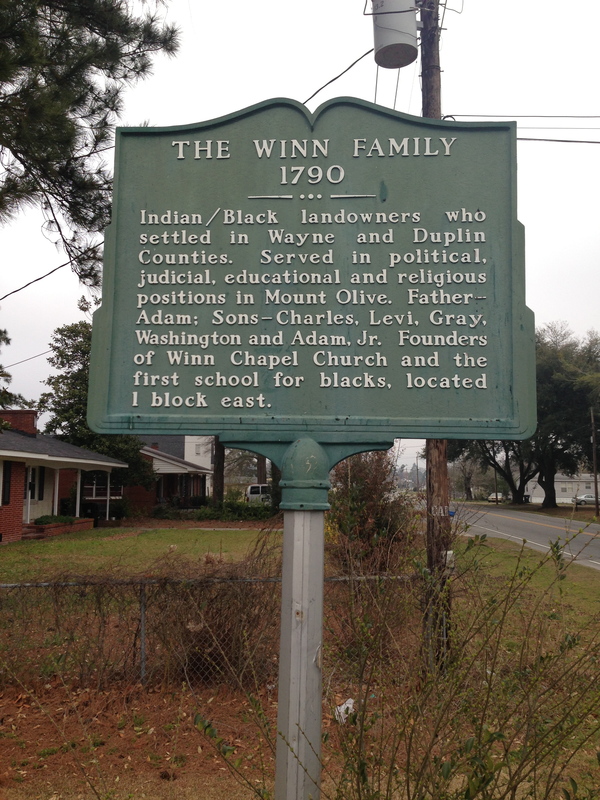 Winn Family Marker, Center Street, Mount Olive. Photograph by Lisa Y. Henderson, March 2013. [Sidenote: And thus, myth is codified. There’s no question that the early 19th century Winns were a remarkable family. However, to my knowledge, there is no definite evidence that there was an Adam Winn Sr., father of Adam Jr., Charles, Gray, Levi, and Washington Winn. There were at least two Adams, as deduced from the dates of deeds. Though it’s not clear when the first one lived, the second was born circa 1805. (What does the 1790 date relate to?) My research suggests that Charles Winn in fact was the son of Charles and Jinny Winn and had a brother named William Winn. The records also reveal a James Winn who bought and sold property with his kin. There are, moreover, contemporaneous female Winns, whose relationship to the “five brothers” is unaccounted for.